Are you hungry yet? You will be. If you know anything about my preferences in life and in manga/anime, it's that I love eating and drinking. After discovering this manga and binging it, I was happy to discover it had received this short adaptation. These kind of quiet, slice of life, fluffy, food shows are just perfect. If you have an hour or so some evening, I suggest putting it on. Make some food and a drink beforehand, and the show will be over before you are. DELICIOUS-LOOKING FOOD!? That's the anime for me!!! From start to finish, this anime left me craving some japanese food. Ok, maybe not the deep-friend asparagus, but I wanted to eat everything else! If I were an anime character, I would be her, chomping away on some potato salad or some fried fish. I just wish there were more episodes of this spectacular anime! Easy-to-watch episodes that highlight the simple enjoyments of life -- good food and drink. It's a pleasure to watch the main character find such happiness from a good meal ^_^ Plus, the episodes are only two minutes long each -- perfect for someone who doesn't like the feeling of committing to a hundreds-of-episodes long series, or for a short break! I love someone who appreciates food like I do! Up side: each episode is pure excellence! The character is so likeable and she enjoys food so purely it makes my heart all warm and fuzzy. Anytime I watched it, I need to snack too. Easy to watch all the eps in one sitting and it's just generally a feel good food show. 10/10 recommend if you need a little light filler in between other series or you need something to fill a little bit of time. This two-minute episode is so comforting that I hope more episodes will be done in the future. 1. It nurtures traditional Japanese food. The combinations of the meals Wakako chose might just be the one you are looking for. 2. It provides indirectly that eating alone is not bad at all. My cousin thought of this habit as weird and loner-ish but what he doesn't know is doing this makes other people actually happy. Like me. Like Wakako. 3. Food appreciaton. Wakako knows what she wants so she orders them the way she wants. It does not bother her what people would think as long as she does not step on other's foot. 4. The anime is lovely. Heartwarming. Entertaining. This was truly a brilliant little gem. 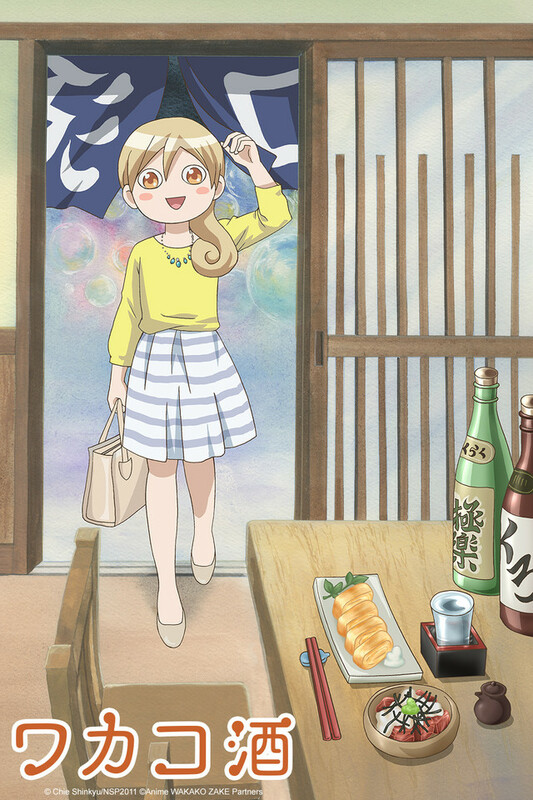 Wakakozake follows a woman's culinary adventures after work within a two minute time frame. I'm quite the food enthusiast, and I found the in-anime food descriptions simple and enjoyable. The humor is also pretty on point as well, as I found myself laughing every episode. I was hooked after episode one, and immediately watched Wakakozake the whole way through! Extremely enjoyable. I look forward to supporting this artist in the future. Merch when? Really makes me want to eat! Each episode is the perfect length, short but complete and doesn't feel rushed at all! Only wish there were more episodes, truly wish I could watch more. It is the perfect combination of great visuals and dialogue explaining each dish! A really great series!